Just because I am Japanese doesn't mean that I like all Japanese food. There are quite a few things I don't really hanker after, and unagi or freshwater eel is one of them. This is due to a very painful, literally gut-wrenching encounter with an unagi no kabayaki (grilled unagi with special sauce) that I had one summer in my mid-teens. Since then, I've only been able to tolerate unagi in very small doses, if at all. On the rare occasion when I've dived into a major portion of unagi, I've always come away regretting it. Too oily. Too earthy. Too...etc. etc. 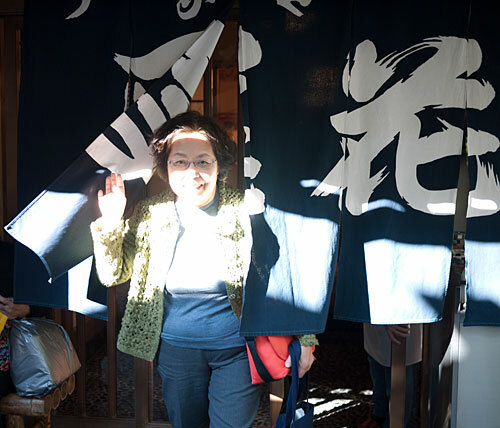 Yet, on a sunny Saturday morning a couple of weeks ago, when my stepfather proposed that we go out to Minami Senjuu for some unagi feasting at Obana, I only hesitated for a minute. When it comes to fresh fish and traditional food in general, my stepfather and mother are the the most demanding people alive. If they both agree that a restaurant is good enough to sacrifice a lazy weekend afternoon's worth of lounging around on the sofa for, then it really is good. So off we went. To get to Obana, the closest station is Minami Senjuu (南千住; see below for details). Once you get out of the station and veer to your left, past the store that sells various traditional Japanese snacks (I don't recommend that store by the way...very mediocre wares), you'll find yourself on a small side street that runs right next to the train tracks. Almost every electric wire pole on the street points you to Obana. Once you get to the Obana entrance around lunchtime or so, it's impossible to miss, since you will most likely encounter a line of hungry people waiting to get in. Your nose will also tell you where the unagi is. The traditional 'in' season for unagi is during the dog days of summer, and in July the line can stretch all the way out down the road, but since we went in November it only reached the entrance to the front garden. 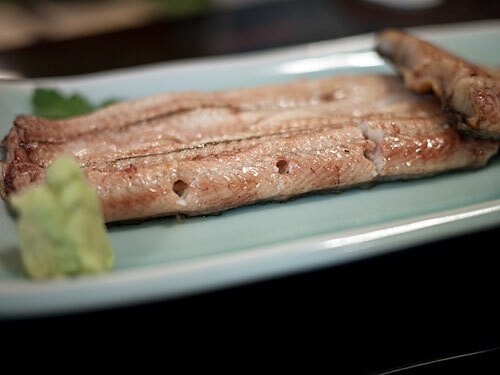 Although unagi orders are placed in advance, appetizer orders are taken after you're seated. They arrive before the main unagi. 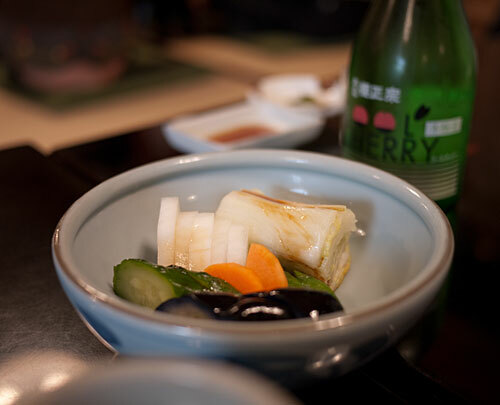 First some oshinkou or homemade pickled vegetables. I am very picky about my oshinkou and these were excellent, not too salty, fresh tasting but still packed with natural umami. 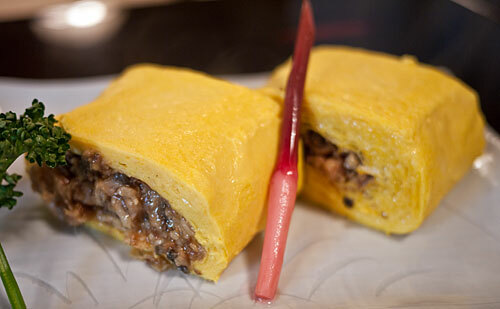 Next some umaki, tamagoyaki (or rather, the refined cousin of tamagoyaki, dashimaki tamago, which is made with a mixture of dashi stock and beaten egg) stuffed with unagi. The even yellow! The thin, even, moist layers! The oily, just slightly sweet unagi filling! Delicious does not even begin to describe it. 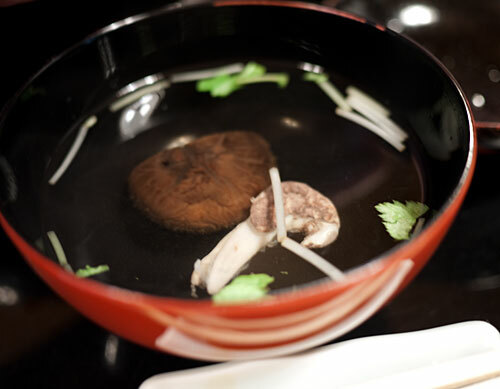 I was not as enthusiastic about the kimosui, clear soup with unagi guts. It tasted like, well, guts. I am not that fond of guts in general, even though that confession may disqualify me as a true gourmet or something. 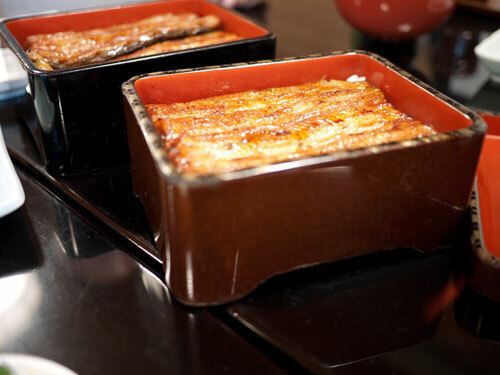 Then, the best appetizer of all, shirayaki, or plain grilled unagi. It was so fresh and delicate and tender, with none of the slightly unpleasant earthiness that you get with unagi at so many places. The star of the show of course, is the unajuu - grilled unagi with shiny, mouthwatering sauce, nestled on on a bed of rice. Obana has three differently priced unajuu on their menu (4,000 yen, 3,500 yen and 3,000 yen at the time of this writing); basically the price differs according to the thickness and size of the unagi. My stepfather had the most expensive one, I had the mid-sized, and my mother had the small one. The small and large ones came in square lacquer boxes. My midsize one came in a bowl. 'Melts in your mouth' is such a food cliché, but really, this unagi melted in the mouth. It was so very rich yet refined at the same time. My mother normally has a lot of trouble with oily fish, but she gobbled her unagi up while making little happy noises. The rice (most likely shinmai or new harvest rice) tasted great too. Full of unagi goodness, we managed to hoist ourselves up from the floor (well, I hoisted myself up, somehow...hey, I'm not used to the tatami lifestyle anymore) and waddled out happily. I snuck a shot of the open kitchen as we left. It looked impeccably clean, which is always reassuring to see in a restaurant. 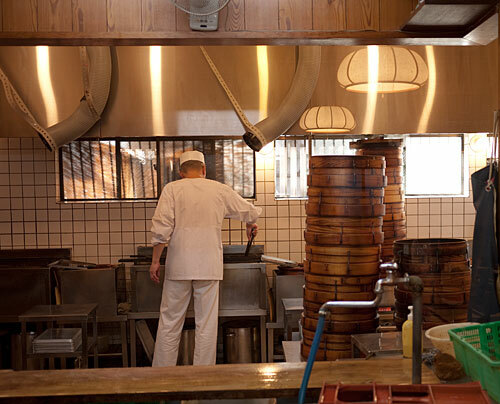 Those stacked up wooden containers are the steamers in which the unagi are cooked before grilling. Here's a very happy customer, emerging back out into the sunshine. Established in the early 19th century, Obana is not an unknown commodity by any means. It's rated tops in the unagi-ya category on the Japanese restaurant-rating sites like Tabelog and Gurunabi, and has been written up frequently enough in the English media that people even snark about it, complaining that it's too expensive, it's too out of the way, the unagi is too soft, whatever. All I can say is, nuts to those people. 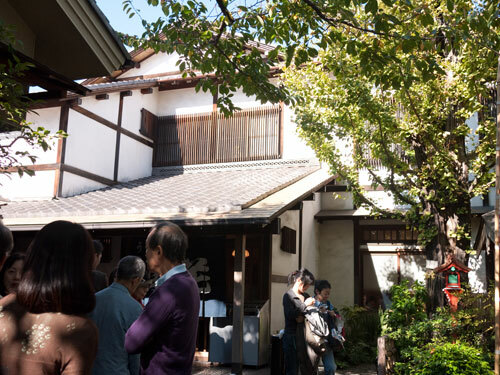 Obana is a great place to experience the best true Edo-mae (old Tokyo style) unagi in a very traditional Japanese setting. 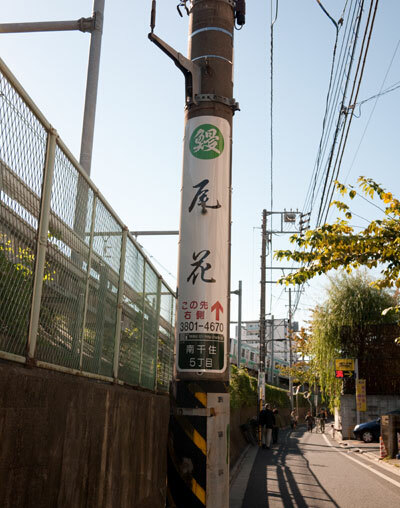 Obana （尾花）is near the Minami Senjuu （南千住）station on the JR Joban Line (常磐線）or the Tokyo Metro Hibiya Line （東京メトロ日比谷線). 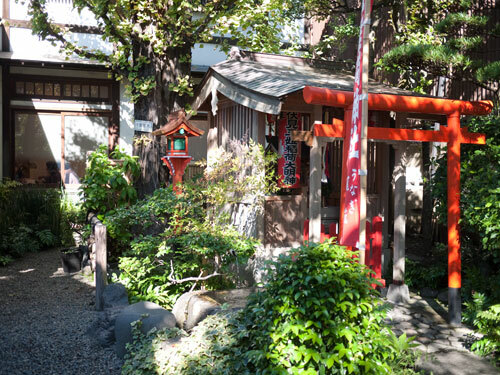 There's nothing else to see or do at Minami Senjuu, so you will have to decide for yourself if an unagi feast is worth the detour for you. Note also that Obana's prices are higher than your run of the mill unagi-ya's. Obana opens at 11:30 and keeps serving all afternoon until they run out of unagi in the summer. If you don't want to wait a long time, try to line up around 11 or even earlier in the summer. During other times of the year they close for a couple of hours in the afternoon. In any case, once they're out of unagi they're done. Obana does not take reservations. If you're meeting people there, your whole party has to be assembled before they let you in. Once you're inside and seated, it still takes a good hour for your unajuu to arrive, since as I mentioned they only start preparing the unagi after taking the order. Don't schedule a visit here before you have to be someplace. Closed Mondays. Also takes some holidays during the year. NOTE: I am not your concierge or travel agent, so please, if you want to make specific inquiries to them, have your hotel concierge or Japanese speaking friend do this for you. 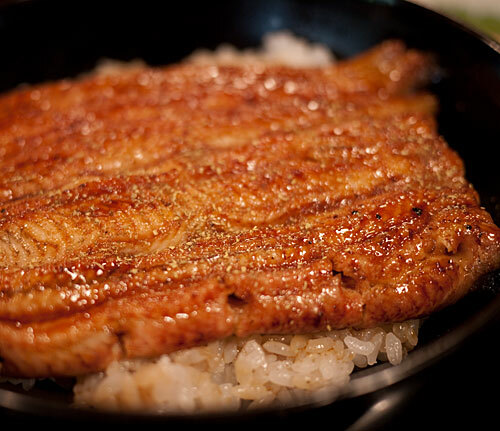 In Tokyo, unagi is prepared by slitting the eel down the back, while in Kyoto it's slit down the front or belly. This is because Tokyo (formerly Edo) was a samurai warrior town, and slitting the belly of something (seppuku! ), even a humble eel, was considered to be bad luck. Submitted by maki on 2010-11-16 05:38. Another thoughtful and inspired piece of writing profusely illustrated with mouth-watering photos. I haven't given much time to unagi but may have to now! I wish I had known about this place over the summer! I had been looking for a place to get some nice eel on "Eel Day" (Doyo Ushi no Hi) and ended up at a smoky, sub-par place in Shibuya. Someday when I return I'll definitely check it out. Its an area of the city I hadn't been to, and a little food adventure is definitely worth the trip. Interesting as always. I'm pretty squeamish on eel, but this all looks really tasty. I noticed that お新香 is both oshinko and oshinkou. I order oshinkomaki a lot and I've never seen the long-o form -- is it something different or just an optional u? Properly read 香 is pronounced kou with a long 'oh' sound, but it often gets shortened to 'ko'. The restaurant you mentioned looks steeped in tradition and may very well be thoughtful about the origin of their eel catch. Indeed it looks fabulous! I just feel the need to point out to at least your U.S. readers that Unagi is not a very sustainable choice. It's convenient that I (nor any of my japanese family) like unagi very much. Although I seem to notice it's a bit of a "gateway drug" to the sushi world for people who don't like the idea of sushi at first. i love unagi!! what a great tradition to celebrate with your parents. i love your blog! this is my first comment, about an issue i feel must be addressed. PLEASE, there are so many people that read your blog, you are in a position to make a difference in a lot of peoples lives. all over the world we have more choices than ever about what we eat. over fishing is a major problem and unagi is NOT an evolved eating choice. they are over fished, even when farmed, and habitat loss is a serious issue as well. monteray bay aquarium has a very thoughtfully presented list of fish populations all over the world, including not only information about over fishing practices species by species, but also fish that have been found to contain especially high levels of mercury or pcbs. this is for everyone's benefit! please give it some thought, you seem like a very articulate and conscious food lover! Thanks for making your point about the sustainability of unagi. I do not think that unagi is something that should be eaten in large, everyday quantities. It's an occasional indulgence. Hopefully the habitat and fishing issues can be resolved soon. Now if there is some site or something encouraging people to leave very similar comments about this issue here, all further such comments will be deleted. This is not a forum for your political agenda, whatever it might be. Thanks for your understanding. I love, love, love unagi. Just reading this post is making me hungry, despite the ridiculous hour. I'm definitely going to have to add this to my list of places to go to. If it's as good as you say, I'd be happy to make an afternoon out of it. I love unagi, but I haven't had the high quality stuff in recent memory. Lovely pictures and post! I bookmarked this place! I'm persuading my group to go there when we go visit Japan end of the year! Could you tell me if the place will be open on the 30th of December? Also, do we need to be able to speak Japanese to order food? Thanks! Your best bet is to have your hotel concierge (or a Japanese speaking friend) call them and ask for you, once you are in Tokyo. The popular youtube channel cookingwithdog had a pretty good recipe video for ひつまぶし (hitsumabushi) recently. This came in quite handy.. I recently bought a frozen unagi and wasn't sure how to prepare/serve it. OMG... That all looks soooo delicious! I love unagi and I live nearby....I think I need to visit Obana!!! were the appetizers you mentioned included in the price or were those extras? I'm thinking of taking my brothers here when they visit but our budget is a bit tight. The appetizers are extra. Obana is not cheap, but it's really good.